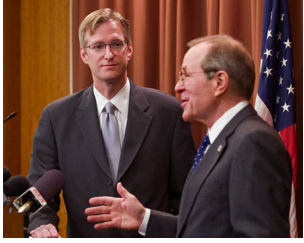 Today Governor Ted Kulongowski appointed Ted Wheeler to the post of State Treasurer. Wheeler is a superb choice, having demonstrated outstanding management skills while Chair of Multnomah County in addition to having investment industry experience prior to entering the public sector. Public pensions now comprise the largest pools of investment capital in the nation and remarkably do not receive any SEC oversight, which instead falls to each individual state. Strong state leaders like Wheeler are therefore needed to butress the corrosive influence of Wall Street and protect both the participants and taxpayers interests.